Houthis Launched Cruise Missile On Nuclear Power Plant In UAE (Photos, Video) 5 out of 5 based on 9 ratings. 9 user reviews. On December 2, the Yemeni Missile Forces loyal to the Houthis announced that it has targeted the Barakah nuclear power plant in Abu Dhabi state of the United Arab Emirates (UAE) with a cruise missile. The supposed cruise missile successfully hit the nuclear powered plant, according to the Yemeni Missile Forces. However, the UAE’s National Emergency Crisis and Disaster Management Authority (NCEMA) denied the Yemeni Missile Forces claims in an official statement published by the Emiratis News Agency (WAM). The NCEMA stressed in its statement that “the UAE’s air defense system is capable of dealing with any threats”. “The authority went on to advise the general public not to pay attention to such rumors disseminated by media agencies issuing false news that question the UAE’s capabilities, strength and security,” the NCEMA said. Meanwhile, local Yemeni activists reported that a mysterious missile crashed in the area of Sin al-Aswad in the northern province of al-Jawf. The sources published photos from the crash showing what appears to be a warhead similar to the ones usually used in old Soviet and US cruise missiles. The missile parts also had Shia slogans written on them. This confirms that this is the remains of the cruise missile that was launched by the Yemeni Missile Forces. Iran bought few Soviet-made Kh-55 cruise missiles from Ukraine in the 90s. The Iranian Army even modified the missiles to become ground launched and called it “Soumar”. However, it’s unknown if Iran has indeed supplied some of these missiles to the Houthis. This was the second missile attack by the Yemeni Missile Forces in the last 10 days. On November 30, the Yemeni Missile Forces targeted southern Saudi Arabia with a medium range ballistic missile. However, the Royal Saudi Air Defense (RSADF) intercepted the missile successfully. hitting a nuclear plant that is in operation is a no no for whatever reasons. Is the power plant operational? AGREED, hitting a nuclear plant is a total NO NO, In fact it is such a big fat NO NO, like gassing civilians ! Might it be a ‘false flag’ attack to turn public opinion against the Yemeni Forces ?? Could well be. It is doubtful that Iran would have supplied it. As remains of the missile have been foundation, highly unlikely. The story behind the “finding” is highly unlikely, more so now I know you’re pushing it. I do presume you meant found, not foundation? I have to check because being a bought and paid terrorist troll like you are you may have some inside information that the UAE are presenting a warhead they retrieved after previously placing it in the foundations of some Yemeni school or market. or a NO NO like the Obomber selling Saudi’s billions worth of bombs to commit genocide in Yeman, as the UN Commission on Human Rights says, and leading to a famine in Yemen that could kill 1 million. The Donald is acquiescent to the same agenda/policies, but the Obomber started this. And no, Obomber didn’t destroy Libya, Syria, and Yemen because bush bombed Iraq. It is NOT yet operational, it is in the construction phase. Yes, only America, Israel and the UK are allowed to do things like that. No, you fool, AGGRESIVE WARFARE is the big ‘no,no’. That’s what the post WW2 trials used as the main reason to hang nazis. The recent jewish Israeli strike on Iranian positions in Syria was an example of this- a crime just as evil as the death camps of WW2. I’m still WAITING for Putin to even criticise Israel over this unthinkably evil warcrime. The Deep State has murdered well over FIVE MILLION civilians since the American created Iran-Iraq war. And only if the Gulf States think their high value assets are in danger of destruction will they think about ending their support for genocidal wars. There are no rules in international arena. You do whatever you can get away with. Sad but true. Yeah, that was stupid… there are some internal conflicts among them, they are becoming desperate and making wrong decisions. they must be forcibly removed by force from these office positons (by us who are fighting them and only by us who are forcing them to do so , who are driving them out of anywhere away beyond their reach countering them head on ) in order to get international peace progress prosperity and a good better and more positive dialogue between all countries and their peoples who their own peoples will lead and decide what to do by and for themselves. manage what their internal and foreign affairs to other countries and people’s would be and not led by some private zionists’s monopoly organisation who wages wars on whoever they want and on behalf of whoever they control and whoever bans rothschild influence and rothschild’s-controlled banks into their country! Doesn’t this article seem odd to anyone? The missile forces were part of the Yemeni military that opposed the Saudi Caliphate puppet Hadi and remained loyal to Saleh. Saleh-loyalists and the Yemeni military that defected to that side are not ‘loyal’ to the Houthis – they’re just allies. Saleh-loyalists and Houthis are two distinct groups making up the opposition – they just share a common enemy: the Saudi Caliphate. Houthi forces don’t have missiles. WTF? The Yemeni missile forces never had any cruise missiles – secret or otherwise. And they never used them before even though their people were getting slaughtered and starving to death? They suddenly decide to use one now when the Saudis are on the verge of a cease-fire and withdrawal? Instead of hitting anything of value like a refinery or military base, they use it against a partially-completed nuke plant? Smells like another BS false-flag to me. Probably to be followed by many more supposed ‘Houthi cruise-missile’ attacks. Can the false-flag Sarin attacks be far behind? I’m always suspicious of these odd statements right after a strike. If they had observers anywhere near the plant, why didn’t they shoot a video of the impact? Why make a statement of success that will immediately be refuted by the other side? Why would they claim certain success, but offer no other details about the nature of the damage, time of impact, etc? This sounds like a claim the Emirates would want to hear in order to issue a blowhard response. “…The NCEMA stressed in its statement that “the UAE’s air defense system is capable of dealing with any threats”. Why would they have any air defense around an uncompleted nuke site? Is this all intended as justification for more advanced US air defense system sales? Or maybe MANPADS sales to the UAE that can be transferred to R2 (Blackwater’s UAE merc army)? And the UAE will be able to manufacture their own plutonium? Oh, that’s comforting. Oh, but of course – located and reported by Western-backed ‘activists’. What – no chemical warhead? No White Helmets ‘saving’ people they just gassed? …because cruise missiles are the ideal weapon to deliver an incredibly-heavy scored iron fragmentation warhead somewhere. …seriously? Bellingcat will be all over this one. The found “warhead” seems odd to me too. The words written on it are “Allah, Muhammad, Ali, Fatemeh, Hassan,.. and the rest of Shi’a Imams. What’s odd to me is that a Shi’a writes the god’s name and the names of people they consider holy and very respected, on something that’s supposed to blow up (Shi’a believers never write the god’s and Imam’s names on paper because the paper may end up in garbage or if it’s written, before throwing the paper out they cut it to separate the names and later put these pieces in moving water, like a river). From what I see, the names are written on the inside (of a barrel?) using a magic pen. Seems they wrote the names to clear any and all doubts that Sh’as fired it. They could write “Death to UAE, signed: Houthis. PS Iran gave us this missile” and it would seem less suspicious from a Shi’a point of view. Yes, and the shouted slogans mostly sound like the same person, which makes me think that it is a recording. Fake News. it’s aim is elevate supposed Iranian support to the Houthis and therefore will contribute for more justification to attack Iran by Saudi-Israeli alliance. All these US and Saudi allegations about Iranian military activity in Yemen is just more disinformation. The Saudi’s have imposed a full naval blockade on Yemen’s ports – so how exactly would any missiles, quite large objects, be arriving? Hauled overland on mules via Omar?!! These are Yemeni Republican Guard missile stocks bought back in 1980-90’s and held and operated by Yemeni Republican Guard. previous bought stock…..its a 90s era missile .you said so. they were in Yemen before the war. no need to transport them. Funny how these missile attacks always crop up when the Saudis are getting really bad press. 1. The attacks on the U.S. ships just after the Saudi bombing of the funeral procession. 2. This attack when everyone is onto their genocidal starvation campaign. Nearly 2000 kilometres of coastline….just a few Saudi, Eqyptian and occasionally US ships conducting searches…missiles broken down into smaller segments…hundreds of wooden hulled dhows moving up and down the Yemen coast….smugglers waiting for ideal conditions: moonless nights with 15 to 20 knot winds to whip the surface and make radars useless. There is a rich tradition of smuggling using dhows in the Middle East. Alternatively they might smuggle the missile parts across the Oman border. It is certainly possible. The question is: it it happening? Yemeni Republican Guard have own missile stocks purchased 1980-90’s – image is of YRG personnel demonstrating a Soviet era designed Scud and launcher. Yes it all depends how many of the Soviet Scuds they have left. According to a website allied with Saleh, the Yemeni army at one time possessed 300 Scud missiles, The 1994 Yemen Civil War saw Scuds being fired off against the capital city of Sana’a. In 2002 North Korea shipped 15 Scud missiles to Yemen. These were North Korea’s Hwasong-5 copy of the Soviet’s R-17. There may have been other North Korean sources shipments. Quite a few Scuds have been fired at Saudi Arabia and also at targets within Yemen (at least 34 ballistics missile launches according to the Saudis). Quite a few have been destroyed in Saudi and their allies’ airstrikes. In particular in 2015 airstrikes over a number of days are believed to have destroyed significant numbers of Soviet supplied Scuds. The airstrikes were against warehouses located in the Republican Guard’s base on a hill just 5 or 6 km outside of the capital of Sana’a. 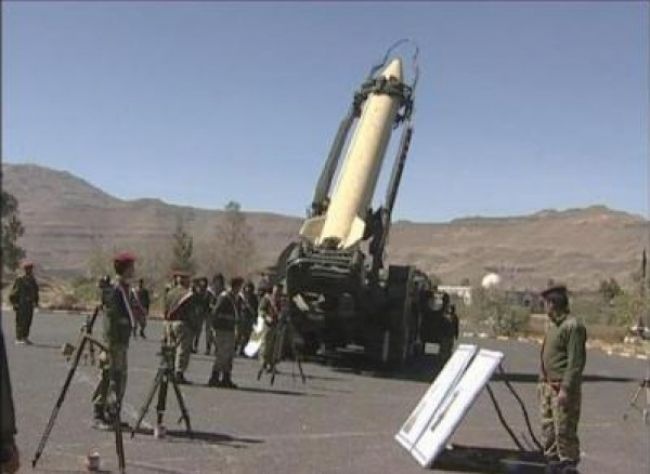 The warehouses stored a large portion of Yemen’s R-17 Elbrus (Scud-B) missiles and Transporter Erector Launchers (TEL). The Yemeni Republican Guard may have run out of Scuds or it may have considerable stocks remaining. Who knows? Yemeni militray bought range of missile systems – longer range Scuds/North Korean derivatives, but also shorter range Tochka systems. Is also suggested they have converted numbers of SA-2 SAMs into surface to surface missiles. But is hard to get clear picture of what’s really going on. Because on one hand the Saudi’s generally deny incoming missiles whenever they can, and yet paradoxically, Raytheon company in US are claiming their Patriot systems have brought down over a hundred incoming missiles from Yemen. The latter may well be heavy marketing spin as Raytheon’s Patriot had awful initial record and was widely seen as disappointing – and they are currently attempting to sell more to other Gulf States. Of course, this means war.